Deep One 2, by Dave Oliver. Click here for more of the artist’s work! Great and dreadful Cthulhu is without doubt Lovecraft’s most recognized creation, and many who are only casually aware of his work may think he’s the end-all and be-all of his work. I’d even personally go so far as to say that Cthulhu in the present day is overexposed, his shadow obscuring many of H.P.’s other fascinating creatures and stories. So on this Throwback Thursday, I’m casting a light on one of his lesser know creations before they… or I… scurry off into the darkness. 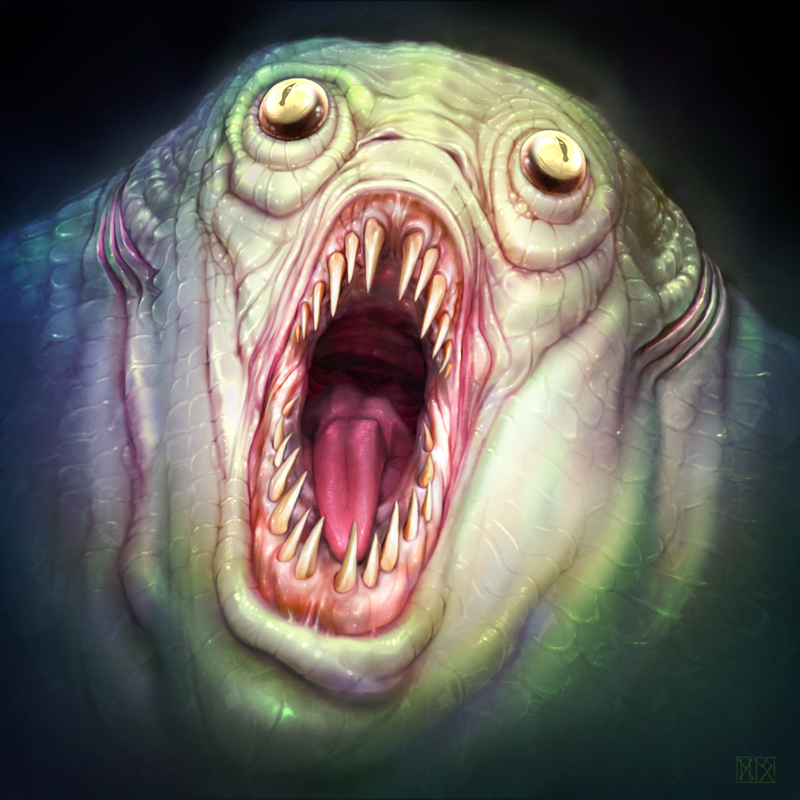 The Deep Ones first appeared in Lovecraft’s novella The Shadow over Innsmouth, which he wrote at the end of 1931. HP himself was never fully satisfied with the piece, being unhappy and critical of his ability to describe the action within the story. It was rejected for publication in Weird Tales in 1933, but ultimately became the only work of Lovecraft’s to be published as a book in his lifetime. He was very displeased with the edition, however, calling its quality and production lousy and slovenly… and rightfully pointed to many typographical errors in the text. But he did like the illustrations. The book had a small print run of under 200 copies, and they sold very poorly even at the bargain price of one dollar in November of 1936. Lovecraft was diagnosed with cancer just a few months later, and died in mid-March 1937… barely four months after its publication. I find it very sad that HP wouldn’t know in life that The Shadow over Innsmouth would go on to become one of his most well-regarded stories, perhaps only surpassed by his famed Call of Cthulhu. It’s a great tale, and I think Lovecraft was entirely too hard on himself about its quality. And yet I saw them in a limitless stream—flopping, hopping, croaking, bleating—urging inhumanly through the spectral moonlight in a grotesque, malignant saraband of fantastic nightmare. And some of them had tall tiaras of that nameless whitish-gold metal . . . and some were strangely robed . . . and one, who led the way, was clad in a ghoulishly humped black coat and striped trousers, and had a man’s felt hat perched on the shapeless thing that answered for a head. I think their predominant colour was a greyish-green, though they had white bellies. They were mostly shiny and slippery, but the ridges of their backs were scaly. Their forms vaguely suggested the anthropoid, while their heads were the heads of fish, with prodigious bulging eyes that never closed. At the sides of their necks were palpitating gills, and their long paws were webbed. They hopped irregularly, sometimes on two legs and sometimes on four. I was somehow glad that they had no more than four limbs. Their croaking, baying voices, clearly used for articulate speech, held all the dark shades of expression which their staring faces lacked. H.P. Lovecraft, The Shadow Over Innsmouth. Unlike many other Lovecraft creations, it isn’t made clear if the Deep Ones are extraterrestrials that have been living on Earth for long aeons before man, or a native species that predates us on the planet. They poses intellects at least on-par with human beings, although their expressed technological skill seems a bit behind. The typical Deep One’s knowledge of occult matters, however, far exceeds that of most humans. As a race, they serve a pair of elder Deep Ones that have grown massive and godlike with age: Father Dagon, and Mother Hydra. And they worship the dreaded Great Old One Cthulhu as well. 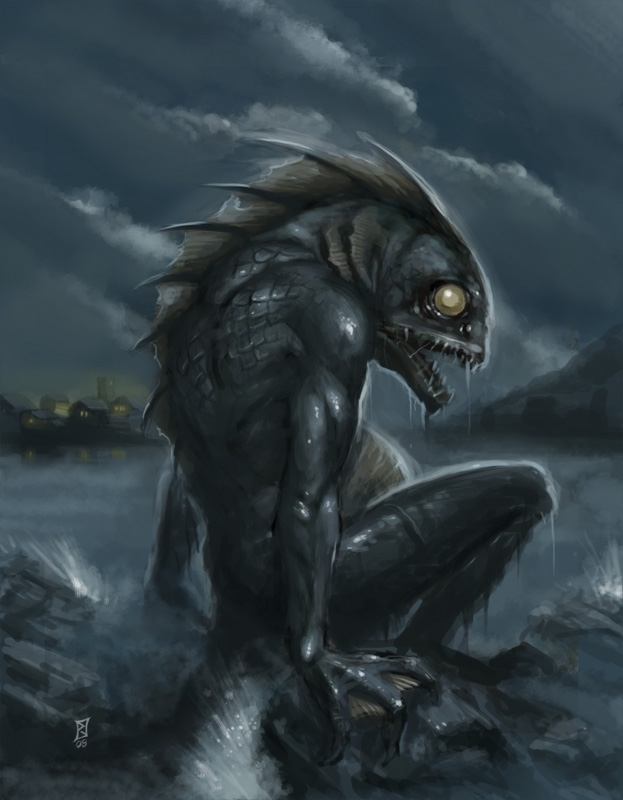 Deep One biology allows for breeding with humans, and doing so is important enough that they will form secret pacts with coastal communities to secure easy arrangement to do so: The Deep Ones provide treasures and good fishing in exchange for human sacrifices and the freedom to conceive hybrids with members of the community. These hybrids are born appearing human, but after adulthood will begin to transform over a period of years or decades into full Deep Ones. The process usually begins with the onset of middle age, and the hybrids will pass along this trait to any children they have with normal humans. Thus, whole family lines and generations completely unaware of their heritage can fall afoul of the family “curse”. It’s unclear in Lovecraft’s writing if the metamorphosis prompts mental changes along with the physical, or if shock and dread encourages insanity which is then reflected in aberrant behavior and a compulsion to return to the ocean. Either way, becoming a Deep One does come with some perks… a major one being effective immortality. Deep Ones don’t age in the sense of growing weak, but can be killed by violence and accidental physical trauma. Deep One Rising, by Pasi Juhola. Click here for more of the artist’s work!